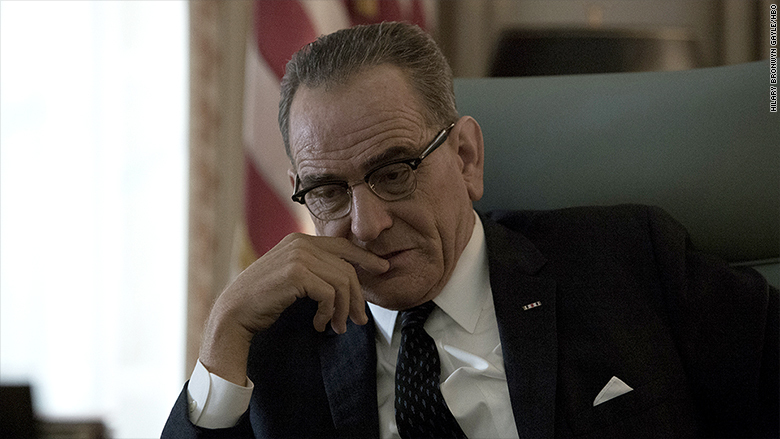 Bryan Cranston as LBJ in "All the Way"
With Bryan Cranston disappearing into the role of President Lyndon Johnson, "All the Way" will more than serve one of HBO's goals with this sort of prestige movie as grade-A Emmy bait. Yet director Jay Roach and writer Robert Schenkkan (adapting his play) have gone beyond that, not just opening up the Tony Award-winning play but creating a film that -- on the eve of this summer's political conventions -- feels especially relevant and timely a half-century after its key events. "All the Way" begins immediately after the assassination of John F. Kennedy and follows Johnson's efforts to pass the Civil Rights Act, and win the 1964 presidential election. In the process, the Democratic president alienated Southern states, and was forced to make a deal with Republicans. He also labored to maintain support from Martin Luther King Jr. (Anthony Mackie), and faced fierce opposition from Southern Democrats, including his friend and political mentor, Georgia Senator Richard Russell (a brilliant Frank Langella). Although LBJ seeks to reassure Russell, push eventually comes to shove, with fears that the South will walk out of the 1964 convention and hand the election to Republican Barry Goldwater. "If you get in my way, I'll crush you," Johnson warns him. Already a multiple Emmy winner for "Breaking Bad," Cranston's performance embodies all of Johnson's contradictions -- someone who could be vulgar and ruthless, yet extraordinarily needy and insecure. In short order, he gets beyond the accent and remarkable make-up (the resemblance is uncanny) to inhabit the role. The rest of the supporting cast is almost equally good. That includes Melissa Leo as Johnson's inordinately patient wife, Lady Bird; Bradley Whitford, nailing the voice of the beleaguered Hubert Humphrey; Stephen Root as FBI director J. Edgar Hoover; and Todd Weeks as LBJ's aide and confidante, Walter Jenkins, a tragic casualty of the time's cultural mores. Having directed HBO's "Recount" and "Game Change," Roach knows his way around political drama. And the story zeroes in on the lingering implications of Johnson being on the right side of history but also sacrificing the South, which continues to reverberate through American politics. At the moment when he should be celebrating his civil rights triumph, LBJ observes ruefully that the Democrats have "just lost the South for the rest of my lifetime," and beyond. "All the Way" also addresses the seeds of the Vietnam War, which ultimately dragged down Johnson's administration and prompted him not to seek a second term. If there are quibbles to be made, it's that the movie feels a tad long at nearly 2 ¼ hours -- the last act lags in places -- and the musical score by James Newton Howard at times risks becoming overbearing. That's not to say the sweeping music doesn't capture the mood. It's just that given "All the Way's" absorbing look at a larger-than-life figure who has kept biographers busy for decades, this is one of those rare productions that requires little embellishment. "All the Way" premieres May 21 at 8 p.m. on HBO.